my comment and my face made it on there, still think my comment was so bland. 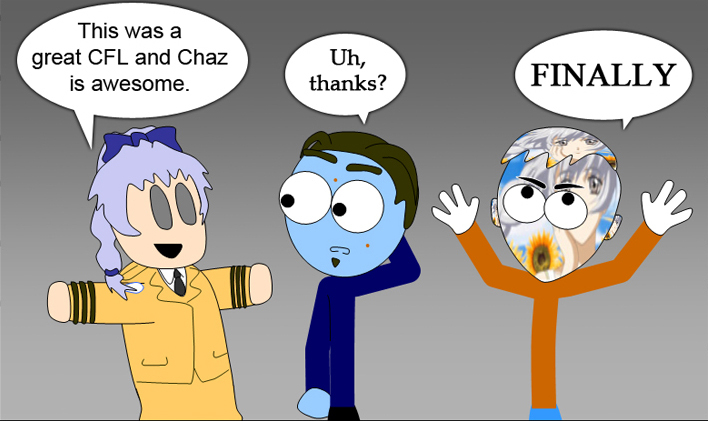 The comic made me smile, Great works Chaz! I’m a little curious what’s a black Hyuga? @Final Messenger the EoE dub voice actor of Hyuga. I hope he's alive... But I'm sure he's more or less working on other projects. TDSA, who provided the frame borders for this CFL. symbv, who isn't here to solve any problems. I love the harem thread more than my family. TDSA and symbv were at their hilarious best, there are simply too many quotes to, well, quote. Farewell PRPD, you'll always be living dead proof that two people- who once annoyed eachother online, can one day not annoy eachother online. This is top stuff, Chaz. Right at the top. I especially like the use of the stubble-hands and the blank eyes for the annie-may characters. Although, your use of 'peer' is a spelling error - correct spelling would be 'pier'. Looking forward to future installments! Last edited by EvangelionFan on Sun Mar 04, 2012 8:50 pm, edited 1 time in total. I'd find humor in this, but I'm much too sad over the loss of our dear friend Josepth. Good to see some more CFLs! I was worried we wouldn't be seeing them anymore as it'd been so long. Amusing as usual, especially that first one. I love you all. But hate you for changing your humorous ways when I arrived. Last edited by Sgt. Griff on Sat Mar 17, 2012 10:15 pm, edited 1 time in total. ^ Now you have explored some of the forum's colorful history in a hugely entertaining form. Find your ideal partner here. Side note- FireFox's background colour has suddenly switched from white to the dark grey (RGB:34,34,34) you see right now, not sure if IE or Chrome etc. have done the same, but hopefully the contrast isn't too ugly. Last edited by chazthesilencer on Sun Apr 15, 2012 1:00 pm, edited 1 time in total.